WOW! Women On Writing Blog: Paul Martin, inspirational author of Original Faith, launches his blog tour! Paul, thank you for sharing with us - I am looking forward to reading your other interviews. I would love to rediscover faith and love in my life. I just want to say how remarkable and kind and nice Paul is. It was great to work with him and interview him, and I learned a lot just from our interview. I think people can really learn a lot from him and his book, which took remarkable perseverance to write. Thanks again, Paul! Kim, that sounds like the right word to me - "rediscover." What we can lose is our awareness of these good things. They're just waiting to be noticed. I've been waiting for this day, Paul, and wish you well on the tour! You know that I love your book and your message. It is sooo important for each of us to begin to move beyond egoism, one choice at a time. Your approach to this is gentle and heart warming. I hope many readers pick up Original Faith because it is a spiritual classic that I know they will return to again and again. I know I have. Looking forward to the 21st when you visit my blog...Hugs! As I have told you in the past,Paul, you are one of my heroes. I talk to my family members about you all the time. Recently I loaned your book Original Faith to my son to read. I also encouraged him to check out your blog. I hope he gets involved there and writes comments. I wish you the very best as you proceed with your tour. I'll be following along with your other fans and online friends. Paul said, "My focus is the experiences that unite us, not the beliefs that can divide us." I think this is the heart of generic mysticism. From this sense of the world around us arises unconditional love. Best of luck with this book Paul! Jan and SusieQ - I truly appreciate your words, friendship and the fact that you've both read OF with such understanding. Raymond - Your comment here really catches my attention. I found a relationship between love and mystical or nondualistic experience too. In fact the genesis of the book was a spontaneous experience of this kind. At the same time, many people lead emphatically good and loving lives without a powerful experience of this type, and so I didn't premise Original Faith on the idea of having one. 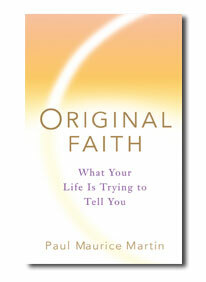 I count myself lucky to be able to get a copy of Original Faith and to know Paul as a person who lives his words. I wish him a good book tour and will be visiting everyone along the way. To me Paul has so much valued wisdom to share and so much a flame of valour for us all. I'm blessed to have Paul in my life. Paul, the reviews posted on your site and the descriptions of it here make me really want to read your book. I loved your poem so much. I'm sure I will love your prose. The idea of finding that which we never really lost sounds so refreshing. Best of luck with your blog tour, and thanks for leading me to this great big blog place! Brenda, I appreciate it - and there is a close connection between my poetry and prose. There are passages in "Original Faith" that fall into the category of "prose-poems," while each chapter is introduced with a poem. The book's meant to engage readers at the level of feeling as well as insight. I think these hard times are causing many of us to look at spiritualism in a new light. It sounds like Paul has the tools many of us seek. Good luck Paul on your journey. I wish you good health in the future. 2 A.M--wow! That's dedication. It's apparent how much Paul appreciation has for the things in his life from his answers. Sounds like a wonderful & inspiring book. Rachon and Krysten - You both seem to have gotten a feel for what I've been up to. Though my personal situation is so unusual, I've tried to use it to speak to a general readership. I identify people first and foremost as "human." So although I happen to be severely disabled, that's really on the periphery of my identity. Also, maybe that’s partly because I was healthy for my first 37 years of life. I imagine that being disabled from the outset would be a different sort of struggle in certain ways. Thank you for all your comments! We held a random drawing for Paul's book, Original Faith, and picked a winner. Creative Nonfiction Wants Your Animal Stories!